I sit staring at a plastic toolbox. My parents were required to provide it for me when I moved out of their house and into my first group home back in 2002 or 2003. It contains all of my prescriptions. It has accompanied me to every group home, crisis house, institution and apartment for the past 13 years — a vital component of my daily regimen. Twice, and at times, thrice a day I’ve dug into that toolbox to pull out the pharmacological medication that was attempting to normalize the imbalance in my brain’s neurotransmitters. Daily I begrudgingly swallowed the medication, desperate to somehow pull myself out of the nastiness of psychosis, suicidal depression and mixed mania. My reasoning for rigid medication compliance was pretty basic. I knew where I’d been mentally and was compelled to comply out of fear that forgetting just one of the four-to-eight pills would plummet me back into the hell from which I’d emerged. In my 18 years with this illness, I’ve tried 37 different medication cocktail combinations. Each prescription drug arrived in a stash of multiple bottles that I diligently, tightly crammed into the toolbox. Bottles of varied sizes and shapes required my becoming an expert Tetris player. 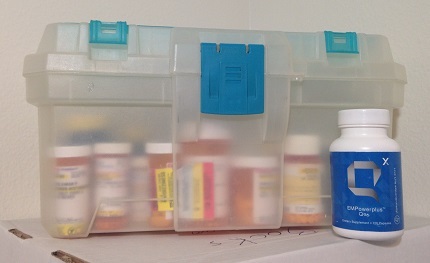 Each bottle had to fit into the toolbox because when I lived in facilities other than my own home, the toolbox was locked so that others couldn’t accidently (or intentionally) steal my meds. I hate that toolbox. I hate what it stands for — my life, locked tightly in a box. In 2009, I learned about the Recovery Movement’s term, Recovery Toolbox, to describe a collection of Recovery or Wellness Tools (coping skills). It intrigued me because I understood the crucial part my own literal toolbox played in my mental welfare — or should I say warfare. As I became more adept at using the newly discovered wellness tools, I became very effective at quelling symptoms before they exploded florid and full-blown. I still had symptoms. Mental illness is chronic, but I learned to rein them in using both toolboxes. When I began taking micronutrients, it was impossible to cram them into my plastic toolbox. There literally wasn’t enough room. Instead, the micronutrient bottles sat on top. I was okay with that because I actually have a separate box for all the over the counter stuff we use in our home when someone gets sick. I never mixed the two boxes, partially due to insufficient space and partially due to my compulsive desire to keep like things together. I mean sure, the micronutrients help symptoms of my mental illness, but technically they are just vitamins and minerals, things that I could buy over the counter. Consequently I didn’t feel they qualified to fit into that plastic toolbox, which made me feel more willing to take them. Initially, the micronutrients made a sudden shift in my mood. I say sudden because I am used to the 6-8 week process that accompanies getting adjusted to any psychiatric mediation. With just 72 hours worth of the “daily recommended dose” of micronutrients in my system, all of the severe symptoms of depression that I discussed with my doctor (exhaustion, low motivation, and suicidal thoughts, etc) began to dissipate. I continued taking my prescribed medications as directed by my doctor. After I’d taken the micronutrients for about a month, my brain started feeling weird. It was like the sluggishness returned, accompanied by fogginess, comprehension problems and several other brain-related symptoms. I figured that the placebo effect had worn off and called the micronutrient support line to let them know how I felt — both literally and figuratively. They mentioned that it was common for the brain to equilibrate the micronutrients and that what I was experiencing sounded like I was now over-medicated. They counseled me to counsel with my doctor as to how to make a medication adjustment. I thought about it. In my 17 years of medications, I had experienced being over-medicated and, yes, it did feel like I was currently feeling. I made the call to my doctor. We reviewed my medications, I talked to him about my symptoms and let him know that I wasn’t experiencing any symptoms of my illness. He listened to my self-analysis, asked some questions and we decided together that perhaps I was over-medicated. He titrated me down 25mg of one of my four medications and we decided to wait see what happened. Nothing happened. It was odd. Normally when I titrate off a medication, the whole chemical imbalance begins to awaken and shift my mental state into chaos. This time, nothing shifted. I waited for a week. In the past, if I’d titrated down on a medication, within a week I was calling my doctor in a panic because of the increase of symptoms. This time, nothing. Nada. It was weird. Little by little, the process continued, I’d take the regular dose of my medications and the recommended dose of the micronutrients. Several weeks into the process, my brain would start to get foggy and hazy and so I’d call the micronutrient support people who would give me a recommendation and then I’d call my doctor and discuss it with him, resulting in lowering the dose of another medication. Weeks became months. During this period of time, a whole host of other things were going on in my life. I was somehow managing to work about 55 hours a week at a full-time, part-time and per diem job. My sweetie and I have always been hyper-alert for symptoms and stress, and he really does an amazing job at working with me to make sure our needs both temporally and spiritually are met, but the cost of living in southern California is outrageous. My balancing three jobs in addition to his job is the only way to keep the roof over our head, food on the table and gas in the cars. It’s not ideal, but it’s required. During the past seven months, in addition to the employment stress, we nearly got evicted because of our exchange student, kicked out the exchange student, realized our new financial situation required a smaller apartment, located a new apartment, began packing, had a sudden and unexpected death in the (out-of-state) family, ward packed up/scrubbed down our apartment while we attended the funeral, came home to a packed van and moved to our new apartment. Additionally my step sons (twins) graduated from high school, my husband changed jobs, my step-daughter graduated from college, we figured out how to unpack our belongings into an apartment half the size of the one we left behind, the semester ended for one graduate level class I teach and began for a newly redesigned graduate level course which I was invited to co-teach by a professor who quit two weeks into the semester. I traveled and presented at the Psychiatric Rehabilitation Association’s conference (after being separated from my traveling companion when our cross-country flight was cancelled) all while keeping pace at my main job. Did I mention that in the middle of all this my health insurance changed, requiring me to leave my original doctor and find a new one? Any human might have been overwhelmed by the circumstances surrounding the past seven months. Gratefully I have my toolboxes. Prior to learning my wellness tools, I would have been incapacitated after just one of the events. Using “tools” from all three toolboxes, I was able to not just endure, but enjoy the events of these past seven months. How on earth was it possible? Divine intervention. As Heavenly Father often works, the divine intervention was subtle. It came in the form of hugs, smiles and action by multiple ward and family members. It also happened as I readily accessed my proverbial wellness toolbox and activating my Wellness Recovery Action Plan (WRAP). But I really believe that it wouldn’t have been possible, if I hadn’t been able to stabilize the chemical imbalance within my brain by taking the micronutrients and relying on the micronutrient support helpline. The symptoms of whatever it was plaguing my brain were so overwhelming, yet so erratic that he’d named the syndrome after me. My symptoms ranged from agoraphobia, panic disorder, PTSD, Borderline Personality Disorder, Bipolar Disorder (rapid cycling between mixed mania and severe suicidal depression), psychosis (auditory, visual and tactile), and catatonia. In short, I was pretty messed up. Gratefully, rather than give me a shopping list of diagnoses, he finally settled on schizoaffective disorder — bipolar type with catatonia. Later I was also diagnosed with PTSD. Keeping that in context, this chart of mineral imbalances/deficiencies helps me better understand why symptoms and illnesses overlap. 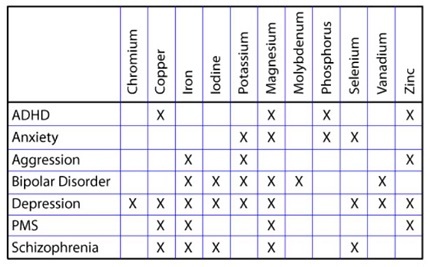 From this picture, it helps me understand that my list of diagnoses actually is a list of mineral deficiencies/imbalances. If I can get those imbalances squared away, I can start healing my brain. Could my symptoms simply be a manifestation of nutritional deficits? I am not the most healthy eater in the world, but I do know that my body doesn’t absorb vitamin D like it should. Could I really minimize my symptoms by paying close attention to micro-nutrition? Yes. In the back are all the medications I used to take. In the front is the one bottle of micronutrients I take now. Technically you can go to the health food store and buy them all in the appropriate proportions and take them. The difference is the 96-hour chelating process that allows the micronutrients to pass the blood-brain barrier (that's why it's referred to by Q Sciences as Q96). If you were to go and purchase the vitamins and minerals from a health food store, since the chelating process is not the same, the nutrients will not be absorbed properly in your body, will not penetrate the blood brain barrier and consequently will pass through your system without the same affect. In other words, you will have very expensive urine. My brain seems to enjoy these micronutrients. My mood is back to normal, my ability to concentrate increased and oddly my memory is improving, too. My brain chemicals are balanced and I feel more normal that I have in the 17 years since my first psychotic break. But what really blows my mind is that I have now completely titrated off all of my prescribed medication. Yes, you read that right, little Miss Sarah Syndrome is, for the first time in 17 years completely off psychotropic medications. For the past three weeks, my blue and white plastic prescription toolbox has sat gathering dust in the corner of my bedroom. Previously I felt like my life had been trapped inside it, now I feel as though I’ve been set free. I have mental clarity I haven’t enjoyed since freshman year of college and mood stability I’ve never before experienced — until now. Who knows what lies ahead? I’m excited to find out. 1 Thomas, D. (2007). The Mineral Depletion of Foods Available to Us as a Nation (1940–2002) — A Review of the 6th Edition of MCance and Widdowson. Nutrition and health, 19(1-2), 21-55.